Within the exhibit was an extensive display of BAPS dolls. BAPS dolls are small cloth dolls created by Frau Edith Von Arps in Germany, from the 1940’s through 1960s. The dolls were handmade and had little metal feet that enabled them to stand. 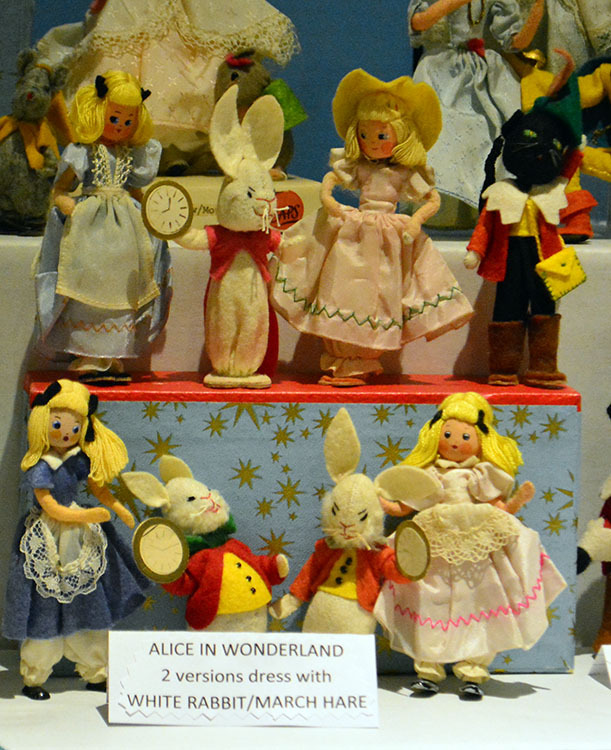 Many of the dolls represented fairytale characters, and are very charming given their size and simplicity. Nancy Moore, who provided the dolls for the exhibit, has a relatively new book out about BAPS dolls called BAPS Dolls and Puppets; in-depth information about the dolls has been hard to find, so the book is a welcome addition to my doll library. I enjoyed all the special exhibits at this convention, but I especially enjoyed Small Dolls, Big Dreams due to my love of small dolls. One of my areas of collection are small antique all-bisque dolls as well as antique dollhouse dolls and furniture, and even before I collected dolls, I collected modern miniatures and made bisque dollhouse dolls. This entry was posted in Cloth Dolls and tagged baps dolls, small dolls, ufdc. Bookmark the permalink. I didn’t realize I had a BAPS doll at home until I saw the display! I loved to learn more about her! I have Little Bo Peep (with 3 of her sheep). Convention is a wonderful place to meet friends (old and new) and learn so much about collecting and preserving!